I've been on a pancake KICK for going on 3 months now. Growing up, my Mom used to tell me she was worried I would turn into a pancake from how often I ate them, but since becoming an adult, I've definitely stepped away from that becoming a possibility. BUT - something switched about 3 months ago and I've been making pancakes a regular rotation in our house. It's always interesting trying to make things Vegan & Gluten Free - I don't have any go-to recipes YET but I've found some amazing ones that I've tweaked to make them simpler and thought I should start sharing this goodness with all of you! 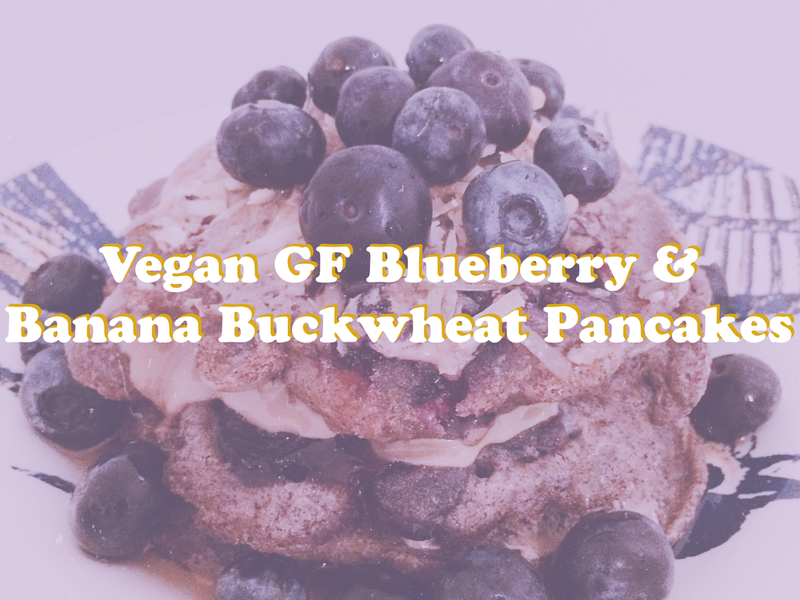 Since I'm on my period, Buckwheat & Blueberries are on the menu this week to keep in line with my Cycle-Synching, and since Buckwheat is my favorite flour - I knew pancakes where in my immediate future! My strategy for pancake making, since I'm no expert at baking ratios, is to Google whatever ingredients I have on hand and pancakes, so far it hasn't let me down. Last night's Vegan Gluten-Free Blueberry & Banana Buckwheat Pancakes were no exception. Buckwheat is gluten-free, but I add gluten-free into my search because sometimes a gluten flour is added into the recipe - so if the title of this post feels redundant - that's why. Alright, enough gibber jabber, bring on the cakes! Pre-heat a large non-stick pan over medium heat. Add a dollop of coconut oil to pan, let melt and coat the bottom of the pan. In a large bowl, add the buckwheat flour, brown rice flour and baking powder together. Next add in the almond milk, maple syrup and vanilla extract. Fold in the diced banana and blueberries then stir everything together. Scoop 1/4 cup of the batter into the pre-heated pan coated in coconut oil. Cook until bubbles start to appear and then flip the pancake and cook for a few more minutes. Repeat for the other pancakes. I spread Trader Joe's Sun Butter [made from sunflower seeds] in between each layer - feel free to use any seed or nut butter you prefer like peanut butter or almond butter. Then I sprinkled coconut shreds on top, extra blueberries and drizzled maple syrup on top to complete the stack. Get creative with your toppings! This recipe yielded 6 pancakes and took about 10-15 minutes to make. These were seriously delicious! I hope you enjoy!